Disliking, and having zero aptitude for science at school doesn’t preclude me coming up with several scientific theories, the hypothesis and measurement both being “I think it’s real and so…yeah.” One such theory being: Time totally, without doubt, speeds up when I’m with people I love. Fact. For example, Tim and I spent our New Year at Raumati Beach with the sort of amazing friends we only ever get to envy other people having. Between the beautiful blanket fort, the nail painting, the guitar playing, the Point Break watching, the homemade liqueur and gin and wine drinking, the feasting, the dancing to Wuthering Heights (alas caught in real time on video somewhere), the nail-painting, the swimming, the reading of many books, the frying of many potatoes, the crying of many tears with laughter and the taking of one stroll, well it shouldn’t be surprising to anyone that time would unfairly speed up during all that. Time also speeds up a little if one of your friends has cleverly made cat ears in your hair made of plaits and pipe cleaners and bobby pins. 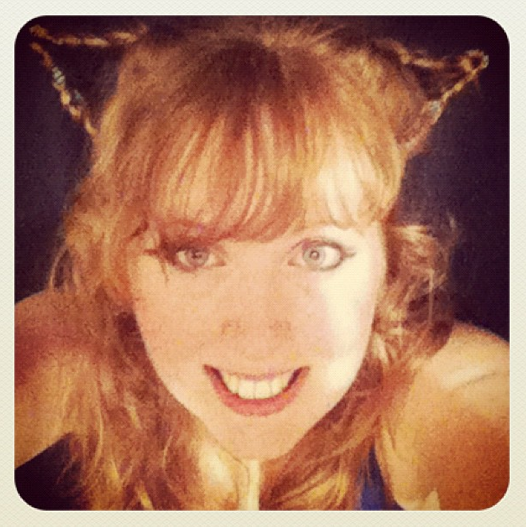 It whooshes right through your cat ears with increased aerodynamics. I’ve always, since day dot, been hopeless at saying goodbye. Memories of crying when things are over – anything from great big emotional ballet performances to visiting an older, cool and magnanimous girl from down the road to play for the afternoon – all blur into one another. Luckily there was less of the actual tears and more of the joking about tears (to keep from the actual tears fighting through, you see) when the Raumati Beach times started to wind up, but I couldn’t help be reminded of all the times I’d been bad at accepting things are over. If you’re hanging out with me and I make yawny noises and comment on the time, instead of wild-eyedly suggesting we bust into the good whiskey, then you can either be disappointed…or, I guess, shiny with relief-sweats. I made this marinated mushroom recipe four times in the last two weeks, and every single time it has been perfect. This is a sneaky lazy blog post, as I’ve already basically given the whole recipe in this story I wrote for 3news.co.nz on what to cook when it’s too hot to think about cooking. However I am tired and frankly a bit sneaky and lazy at the best of times too, plus, putting the recipe in two separate places on the internet shows you just how strongly I love it. Speaking of things I love, wasn’t I lucky to score these knives and forks and bowl from Mum! The knife and fork have been in the family for generations and the plate just looks like one that has been in the family for generations, which is good enough for us. You don’t even need a knife to eat these mushrooms but I like how it looks, so it stays in the picture. I made this for myself on the 29th, for the aforementioned friends on New Year’s Eve, for family on the 7th, and for myself again last night. 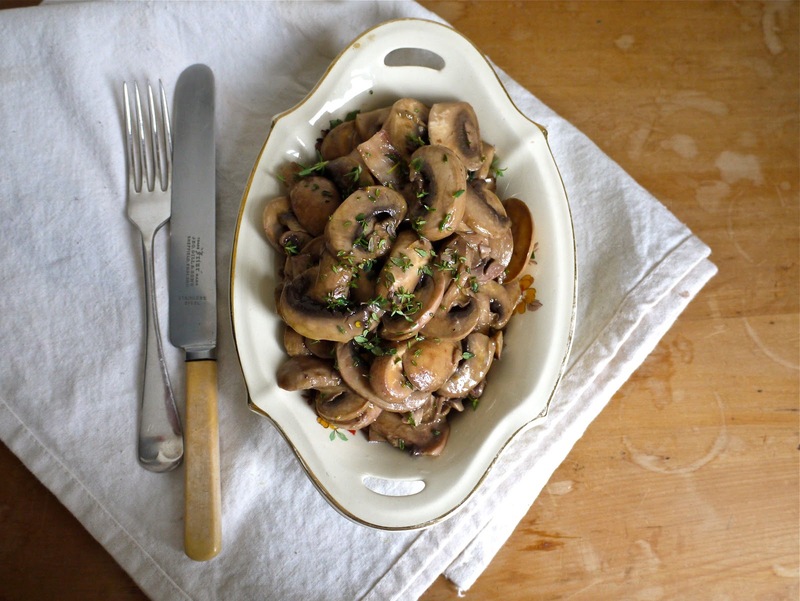 Something about the name Marinated Mushrooms makes people nervously say “Oh no! You should’ve started it six weeks ago! We’ll have to have it another time” but this is actually good to go as soon as you stir it. It’s at its peak deliciousness after about 12 hours in the fridge, but truly. I tend to eat half of it while I’m making it, that’s how good it tastes. I came up with this myself, but with a little inspiration from recipes belonging to the wondrous Nigella Lawson and the also quite wondrous Yotam Ottolenghi. Quantities are vague because I never once thought to weigh or measure the amount of mushrooms I was using. Just guess though. Science can’t get you here. Mushrooms; as many as you’d normally feed people – maybe a heaped handful per person though if you’re stuck. Use the cheapest white button ones you can find. Wipe or peel the mushrooms – dirt will cling, and though it sounds fussy sometimes peeling’s much easier. Slice thinly and pile into a bowl. In a small cup or bowl mix the dressing ingredients together, tasting often and adding more of whichever ingredient your tastebuds feel it requires. Pour over the mushrooms, mix carefully. If it looks like it’s not dressed enough, drizzle in some more oil. Taste for salt – I add quite a lot – then either eat immediately or cover and refrigerate. Maple syrup on mushrooms might sound a little too daring, sure. 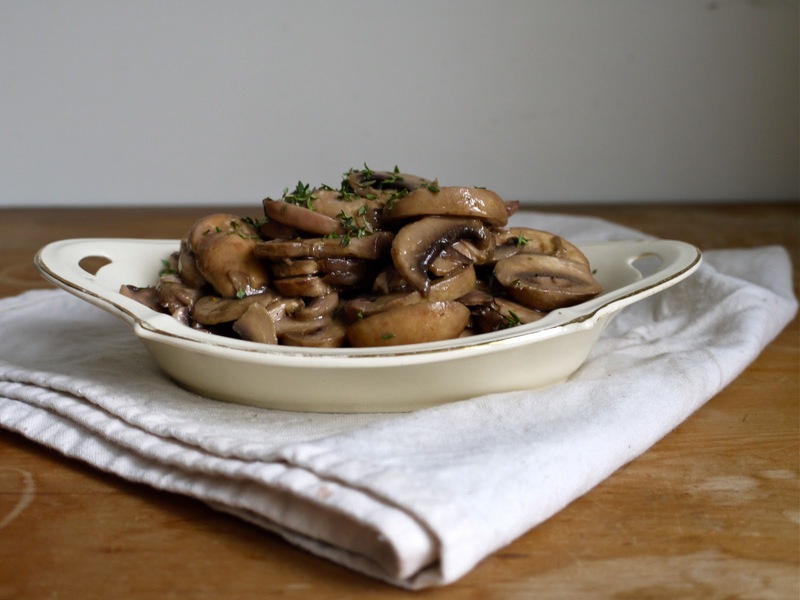 But raw mushrooms are quite mild and almost like tofu in that they can absorb into their porous surfaces nearly every flavour that passes them by. However, not to the point where you might as well be sucking salad dressing dejectedly (or happily!) from a sponge soaked with it. Their delicate, rain-on-cut-grass freshness is mighty fine with the smoky maple syrup and sharp mustard, and the polystyrene texture becomes even more pleasingly yielding to the tooth the longer it sits there in its dressing. Basically: this stuff is addictive so watch out. I’ve never eaten so many mushrooms in one sitting, in my life. 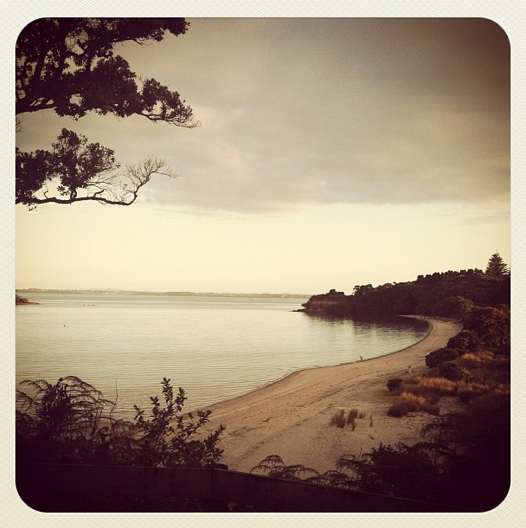 Needless to say, camping at this place with whanau for the 25th year in a row made time speed up significantly again. Somewhat grounding was how I got bitten to pieces by mosquitos, feasting away at my apparently delicious blood till my legs looked like bubble wrap. However I’ve bought some antihistamines and am hoping for the best, and now that I’m back in the world of Monday mornings and routines and so on, heck, they’re a reminder that summer holidays did happen and they were amazing. Until I got bitten. What did you all get up to over the Christmas/New Years era? I’ve missed this blog a bit while internet was intermittent, but I’ve loved sleeping properly, seeing family and friends, eating well and reminding myself of the good things in my life. Title via: Janelle Monae, Mushrooms and Roses from her album The Archandroid. This song’s a bit ridiculous (like what does that title even mean?) but I like her stuff and the melody and intense chorussing does pull you along in a dreamy fashion. And it does have the word mushrooms in it. Pat Benetar, We Belong. I’ve always disliked every single song Pat Benetar has ever called her own – except this one. It’s so annoyingly alluring and floaty and lush and I can’t honestly say I don’t like it. In fact…without quadruple negatives to hide behind…I like this song. Stephanie J Block, Get Out And Stay Out. Her voice is stunning. Everything from the emotional, shuddery talk-singing at the start of this song to the crystal clear, exhilarating but not over-extended belting at the end is just so very listenable. Next time: Something new, something you’ve never seen before, something highly edible, for starters. I guess this is the last time I can get away with saying it before it gets too weird, so…Happy New Year, everyone! deliciously wonderful as usual. you turn mushroom talk into poetry! Look at that beautiful scenery, and those adorable air-whooshing cat ears. Would I seem very Baby-Sitters Little Sister if I said these two pictures make me want to imitate you, and the awesomeness that was your summer holidays? Looks like you've had a great time, despite the mosquito bites ! WHY AREN'T WE STILL ON HOLIDAY CAPITAL LETTERS? IS IT BECAUSE WE ARE BEING PUNISHED FOR KNOWING THE TRUTH ABOUT STACEY? Still camping in the rain – although not as wet and prolonged as the “shall-we-build-an-ark” continuous deluge of Saturday. Made a ginger and peach cake on the campfire last night – substituting aforementioned for the bananas of previous enterprise. Very light and fluffy – but a little smoky and charred around the edges because of an accidental “power-outage” mid baking, when the fire needed to be boosted. Mosquitos lonely and hungry without you. I luuuuurve mushrooms. Inordinately. I'm not a peeler myself, but BF is. I was just thinking how gorgeous that dish was. You are a lucky girl! Totally agree on the time speeding up thing and also the scientific method. Hopefully time will speed up when hanging out with me soon when I come to Welly because I might cry if you do the yawny time looking thing and that'd be awkward. Yum, mushrooms! Ah, holidays! I too get rather teary at things being over, hence my tendency to get really weepy post-holiday blues. (Not too bad this year though! win!) Hope your mosquito bites aren't giving you too much grief. My mum makes amazing marinated mushrooms, but I'm almost certain her recipe doesn't contain maple syrup, therefore yours wins by default. And oh, oh! Don't talk to me about good-byes! There were too many this weekend in Melbourne, the worst being with Lisa, who I was meeting for the first time and who, her being from Canada and all, I can't know for sure when I'll see again. Although I know I will. You can expect definite heart-tears upon farewells whene'er we meet, darling Laura! These should make the post-holiday blues a little bit better: Ron Swanson Valentines Day cards. That's a sweet thing to say 😀 good thing poetry doesn't have to rhyme, because hello, mushroom? What rhymes with that? Maybe a little bit Little Sisters-ish, but very awesomely so 🙂 I had such an amazing time but alas the mosquito bites still haunt. Hope your Christmas was wonderful, how could it not be in maply syrup mecca! I just know you'd love these, with your savoury-sweet fearlessness. Booo hope the farewell to Melbourne wasn't too terrible, although there's nothing quite like a good, hearty sob in an airport amongst nervous strangers. Oh wow, your holiday sounded perfect (minus the mozzie bites!). Love that shot of the beach, makes me miss home… As a young-in the only way I liked mushrooms was marinated in copious amounts of balsamic vinegar and olive oil, I haven't done them for awhile but so should. I used to add a touch of honey to balance out that vinegar hit, but your maple syrup addition sounds lovely! Those mushrooms look wonderful! I'll have to try it. They're a staple for us vegetarians, but it's easy to just cook them in the same old ways. Thanks for sharing! You are absolutely right, on two counts – time definitely speeds up when you are with people you love, and secondly it is an absolute fact that if you think something it's real – no scientific proof necessary. 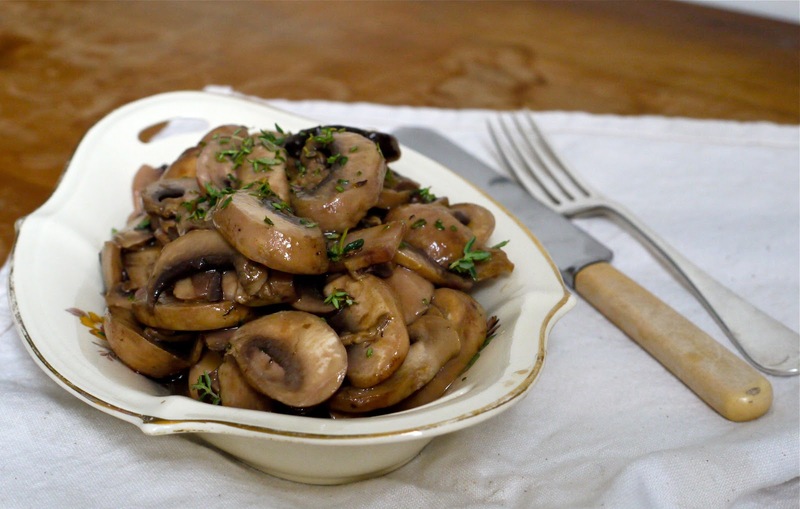 I love marinated mushrooms, but have never tried adding maple syrup – I can't wait to give that a try. You would probably also love Nigella's Mushroom Linguine, which I did an adaptation of here http://couscous-consciousness.blogspot.com/2010/09/mushroom-linguine-recipe-quick-easy-3.html I always make extra now, as it is especially good the next day – like a pasta and marinated mushroom salad, and let's face it, what's not to love about that?! So pleased you had a great holiday, and really looking forward to enjoying more of your awesome blog in 2012. I absolutely hate goodbyes. And endings. And time flying faster than it should. But I think I could pretty much love these mushrooms! Have de-camped. Agree about the 'sad good-byes'. It always feels so empty after each of our tent-mates depart. We have perfected the camp cake… made a wonderful real cherry and coconut cake with no charring at all…although we did need to tinfoil over one side of the barbecue to simulate an oven. A definite re-make and camp standard from this point on. Feel free to include it in your cook book. I don't like mushrooms. At all. But somehow I want this inside of me.